'New York. The city of a million stories. Half of them are true, the other half haven't happened yet,' drawls the cod private eye narration at the beginning of The Angels Take Manhattan, dialogue that comes complete with the cinematic tropes of that picturesque skyline dissolving to a clattering typewriter. Sam Garner (Rob David), the private eye hired by Grayle (Mike McShane), is one of several narrators, indeed one of several investigators, that are typical of the Moffat signature in Doctor Who. And true to form, they are all telling us the story from different perspectives. It may be told as a hard boiled thriller in the style of Chandler and Hammett in the opening sequence and is modified later when River and finally Amy take on the narrator/writer duties, but it is also a self-reflexive return to the way Sally Sparrow and Kathy Nightingale in Blink were the equivalents of ITV's Rosemary and Thyme and likewise how their encounter with the Weeping Angels was told via amassing clues and messages. The pre-titles sequence is beautifully redolent of the period, full of atmosphere and threat, silhouettes, shadows and moving statuary, including the Statue of Liberty. 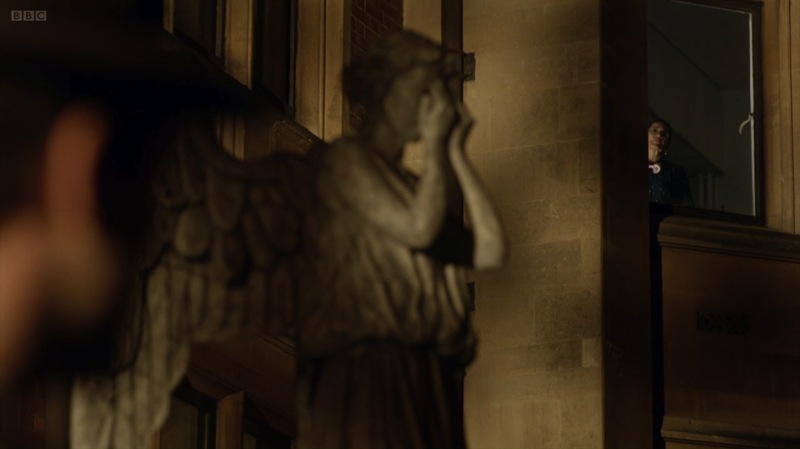 It immediately takes us back to the promise of Blink's final coda where the Doctor addresses the audience while a series of images of statues, gargoyles and public art appears on screen, suggesting it is not just the Angels but that every statue may come to life if we look away. It harks back to mythological symbolism of the Gorgon and Baba Yaga and fairy tales where dwarfs turned to stone in sunlight. The very act of looking and the fear of blinking, the glimpse of something extraordinary in the corner of the eye, becomes the primal, childhood fear of monsters springing to life and creeping up on you, the uncanny generated by our ordinary, everyday surroundings. Director Nick Hurran capitalises on this feeling, with high, overhead shots of Garner entering the doors of Winter Quay where, according to Grayle, the Angels live. He intercuts or frames shots of the statuary on the building with the faces of people who are seemingly trapped within and must be forever vigilant lest the stone masonry comes alive. 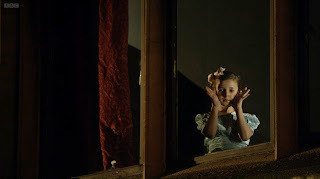 It's a suitably creepy sequence, tapping into Blink's themes about Gothic space and childhood fears especially when a brief shot shows a child mimicing the Angel's pose and almost playing peek-a-boo with Garner. In Garner's dialogue and attitude, his dealings with Grayle and his exploration of the Winter Quay building, this episode uses the 'thick nocturnal atmosphere and semi-expresionist style, tough guy dialogue, seedy urban demimonde, stock criminal characters from the gangster film and... a sense of large-scale intrigue and conspiracy' often shared by detective pulp fiction and Gothic romance (1). 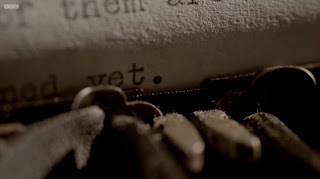 The typewriter reappears, setting Garner's fatal experience within the fictional milieu of a novel, completing the heading of Chapter I - 'Death of a Detective'. It is hyperbolised Gothic, where buildings, rooms, objects and people convey secrets, hidden messages and clues to solve a particular mystery. The Winter Quay building and its corridors also reflect back to Toby Whithouse's 1980s-styled hotel in The God Complex (which in itself presented a hanging narrative of the Pond's departure) and the film-noir science fiction of Dark City (1998) and Blade Runner (1982) and their bleak, fatalistic tones. We learn that White Quay is a prison, a battery farm (a time-fueled recharging station in another sense) for the permanent residents affected by the Angels' disorientating ability to send you into the past to die while ‘in the present they consume the energy of all the days you might have had'. Behind the doors of the building, the victims wait to catch up with themselves. 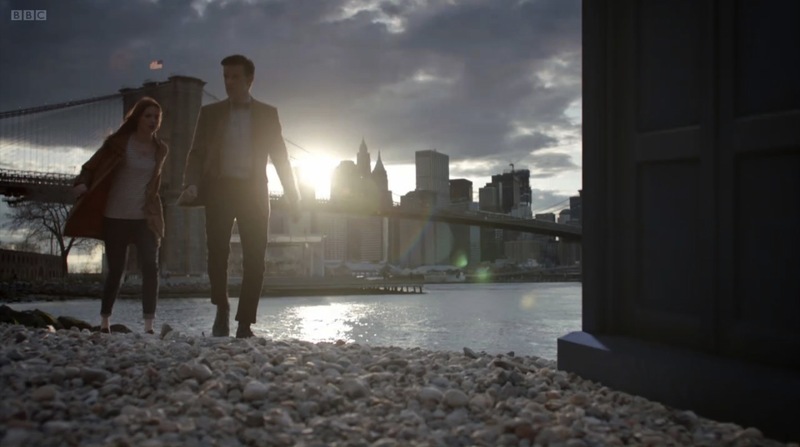 It's a wonderful opening that also cheekily keeps the promise of Blink and something speculated upon the last time the Doctor found himself in the vicinity of the Statue of Liberty. The expressionistic style of The Angels Take Manhattan is very appropriate to some of the visual symbolism that I've been discussing over the last five weeks. Besides the metadiagetic narrator, episodes have been highlighting a darkness and light scheme and they have seen the light being engulfed by the dark in the opening titles, in the use of the light bulb motif and the way stories move from brightly lit locations and into dark interiors. Last week, the slow invasion was perpetrated by the alien Shakri, a Gallifreyan nightmare from the dark space between dimensions and this week we have an almost black vortex down which the TARDIS tumbles, a noir New York full of Weeping Angels who truly appreciate being alive in the dark and shots at twilight as the sun sets over Times Square and Brooklyn Bridge and day gives way to night. 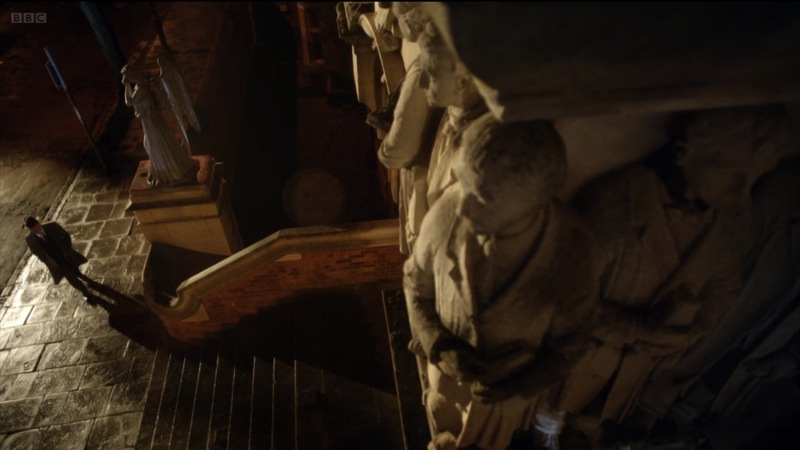 There's even a light bulb being soniced by the Doctor in the final attempt to escape from Winter Quay and the Doctor changing the TARDIS's rooftop light bulb too. So, after a superb five minute opening sequence we then get Sting rather unnecessarily telling us the bleeding obvious as Nick Hurran makes a virtue of his Central Park and Times Square locations. It's the backdrop for the Doctor and his companions and their banter about Amy's need for reading glasses, a set of Harry Potter specs that really do not suit her, and her horribly lined face. This is before Rory goes and gets himself hurled back in time to an encounter with the Angels at Winter Quay. He only popped out for a coffee, bless him. Meanwhile the Doctor gets rather hot under the collar reading a pulp detective novel and Moffat, with some irony no doubt, momentarily transforms the Time Lord into said young Mr. Potter. 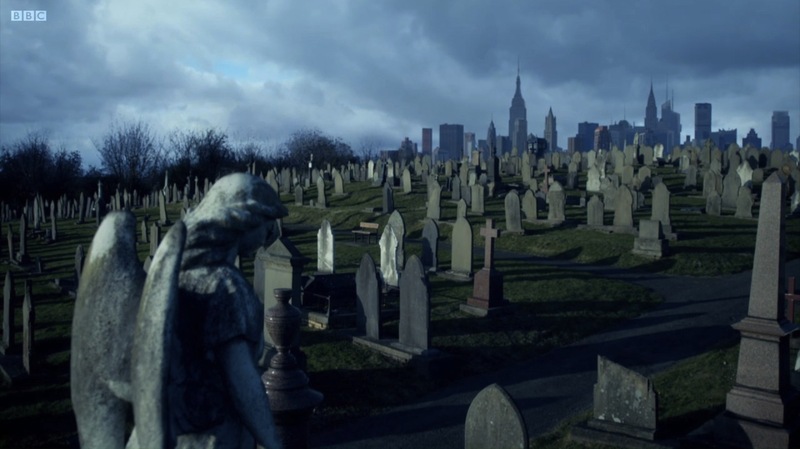 In effect, The Angels Take Manhattan is not only told through the clues in these typewritten thoughts but then, most importantly, through the pot-boiler novel ghostwritten, one could say, by River Song as Melody Malone. River is a natural author, having already written a detective novel in the form of a diary that presses the pages of her life with the Doctor together but which is experienced by them both in random form. The reading of this book, or more specifically its chapter headings, is almost a parallel to the peeling back of the wallpaper in Wester Drumlins in Blink, both being a supernatural augury of events that have happened, are happening and will happen. 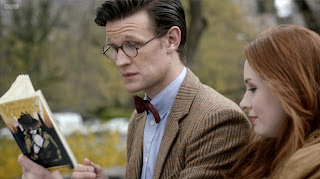 More significantly, the book's word for word description of the events affecting the Doctor, Amy and Rory also remind us of that scene in Blink when Sally and Lawrence have pieced together the clues and answers in the DVD Easter egg conversation in linear order just as Lawrence simultaneously transcribes them in shorthand. Non-linear clues and obfuscating messages emerge as a visible linear narrative, one shaped by how Lawrence’s transcript eventually reaches the Doctor at the end of the episode. Here, Melody Malone's book has somehow found its way into the Doctor's pocket and its narrative, written in a future/past that we haven't seen yet, begins to unfurl on screen. It's worth noting the storytelling motif here too which is a familiar trope in Moffat's Doctor Who and certainly one that has shaped Amy's own story and her childhood recreations of adventures with the Raggedy Doctor she met in her garden so long ago. The Doctor reading back to Amy a book to which she has already added the final word, the coda to her own adventures, seems an absolutely perfect way to start to draw the threads of the Amelia/Amy text together. It also allows the characters' knowledge of what is happening back in time where Rory has been trapped and, through its chapter headings, the book provides tantalising clues to an unfolding episode as watched on its first transmission. 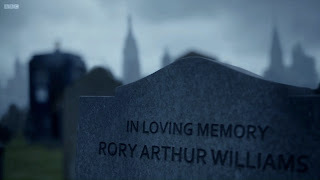 The effect of this relies somewhat on no prior knowledge of the events of the episode and that's another common trope in Moffat's work and symbolised here by the notion of events being affected by the reading ahead of Melody Malone's novel just like the 'spoilers' warning attached to River's diary. 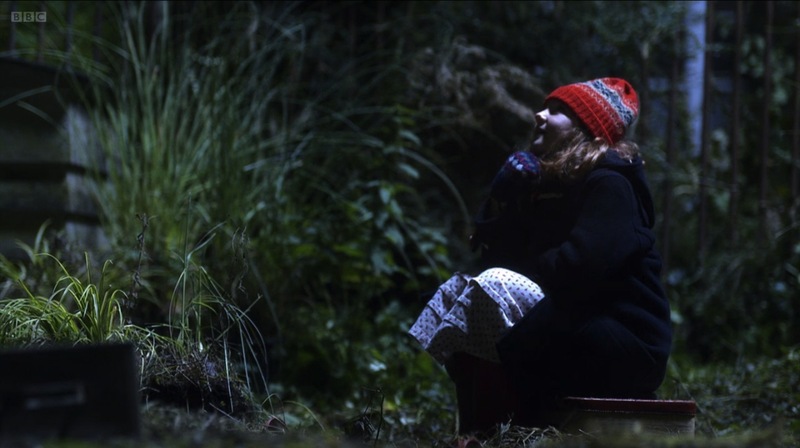 Is the Doctor's warning to Amy prophetic? Would reading ahead to 'find that Rory dies' have alerted her to the fate that awaits them? The Doctor is certain that prior knowledge will mean events are 'fixed' but does this also mean that River actually knew what would happen to her parents? After several seasons where Moffat demonstrates that time can be rewritten or unwritten, he throws something of a spanner in the works and suggests that neither the Doctor nor River can interfere with time, 'not once you've read it' in a book. To emphasise that rather unconvincing volte-face Moffat gives the Doctor the dire prediction to Amy that 'once we know what's coming, it's written in stone'. Hurran also prefigures the 'fixed time' climax of the story with a slow pan down to Rory's tombstone in the New York cemetery. Later, this is emphasised in the scene where the Doctor has to free River's wrist from the grip of the Angel. He demonstrates to Amy that, because she read this incident in the book, he no longer has free will and must break River's wrist and follow the book to the final letter. 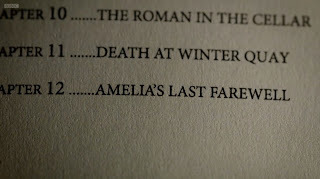 The chapter headings and the last page of the book - significant of the delayed endings and hanging narratives of Moffat's work on Doctor Who - are also symbolic of the closure of the Amy Pond story. It's been foreshadowed for so long now and this last delay, the Doctor's insistence 'then it doesn't have to end', is only temporary. When the Doctor reads that last page, the one eventually written by Amy and that expounds on the exciting adventures that have been and will be again, it is almost as if we're back in the TARDIS while the Doctor reads the letter left to him by Madame de Pompadour in The Girl in the Fireplace. There have been many, many letters and messages of significance in Moffat's era - Reinette's goodbye, Kathy Nightingale's letter to Sally, Evangelista's letter to Donna and the various messages sent by River, to recall but a few. Just as Gothic stories litter their plots with clues placed or hidden in artefacts and letters, we not only get the significant last page of the novel but also the instructions in the novel about bypassing the time distortions preventing the TARDIS's landing and River's suggestion for a side trip to China to discover the message hidden in the vase that guides the TARDIS to land in 1938. Nick Hurran intercuts his New York travelogue with lingering shots of statuary, finding menace in ordinary surroundings, and pre-figures Rory's fate in that brief shot of the cherubs supporting the Angel of the Waters fountain, momentarily bearing a snarling visage and coupled with the manic, child-like laughter on the soundtrack, that accompanies his passage under the Bethseda Terrace and his meeting with River in 1938. This same sense of foreboding then underlines Hurran's slow crane shot above the cemetary, after the TARDIS has managed to land and both Amy and the Doctor understand the connection to the Weeping Angels, with the figure of an Angel prominent on the left hand side of the shot. 1938 and 2012 are 'causally linked somehow' and one assumes that this suggests the surviving Angel that seals Rory's fate, the hanging thread that Moffat will give a vicious tug at the end of the episode. It's not quite clear what the motivation for Grayle's arrest of River and Rory is. How did he know who to arrest, where to arrest them and how they were connected to the Angels? Yes, he's 'a crime boss with a collecting fetish', has an Angel chained up in his front room and sent a private investigator to check out Winter Quay. The only way that Grayle can know of River's connection is through the Melody Malone novel and we must presume he's read it or is reading it while it writes itself during the episode. However he more or less comes across as a crude cipher whose role is to get our characters from point A to point B, as River flirts madly with the Doctor using Chinese earthenware and Rory ends up babysitting in the basement. It's a bit of thankless role for Mike McShane it has to be said. 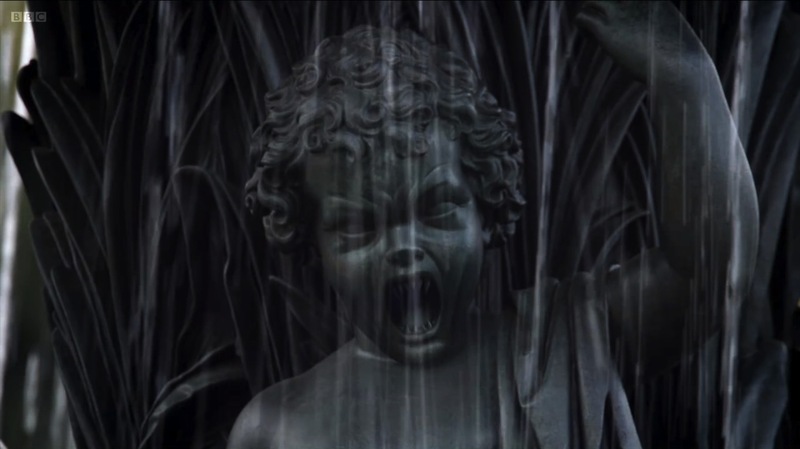 The sequence in the basement is rather glorious and Hurran manipulates the scares and the dark/light motif effectively, repeatedly plunging the screen into darkness and intimating the movement of the stone cherubs through sound effects alone. 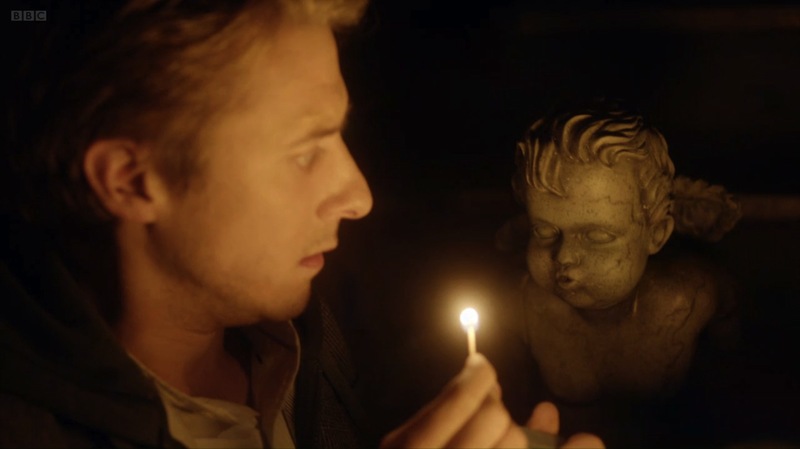 He uses the faint glow of fire from a match to briefly illuminate proceedings and the final plunge into darkness after the cherub blows out Rory's match is used to jump to River's own predicament. When the Doctor arrives, the scenes with River still afford much of the husband-wife screwball comedy banter that Moffat likes to use between the Doctor and River. Smith and Kingston achieve it with their usual twinkle of mischievousness. However, there is a feeling, when she updates him as to where they are in their mutual timelines, her days as 'Professor Song' carry as much a sense of foreboding as do the combined fates of Amy and Rory. We're nearing the end of her story too. 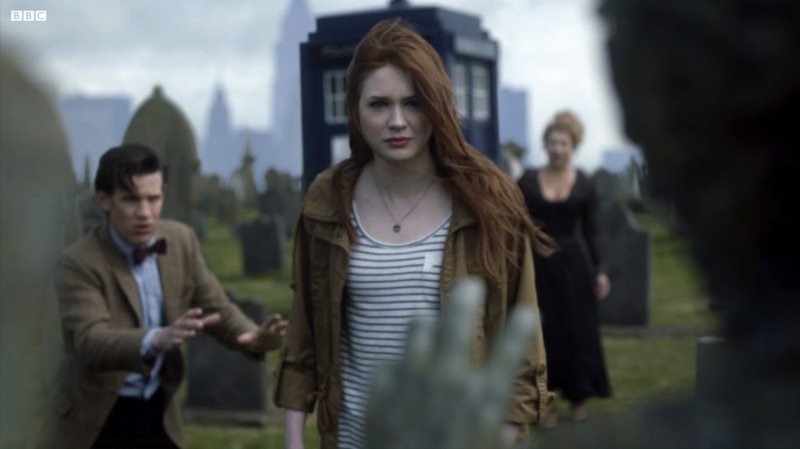 Also note that in contrast to the Melody Malone novel relating the last days of the Ponds, we have River's timeline edging towards completion as the Doctor's story is being deleted 'from every database in the universe'. The continuing flirtation with the idea that 'silence will fall when the question is asked' is present and correct as is the familiar notion of time written and unwritten. River is the woman who killed the Doctor but then, 'Doctor who?' 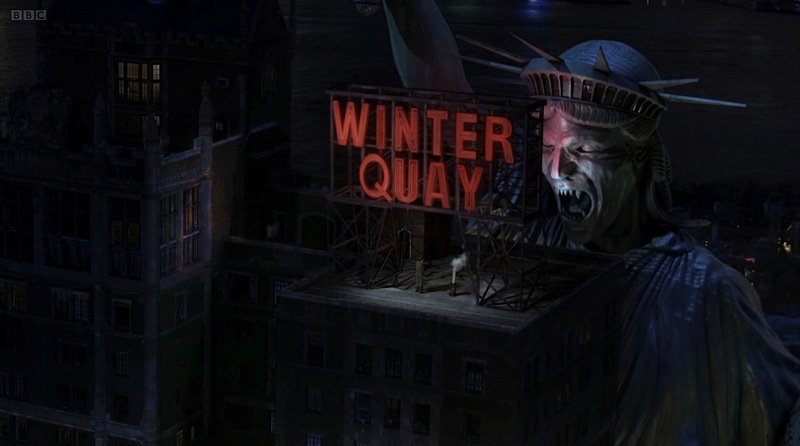 and Rory's attempt to run from the Angels also suggests a paradox that can 'un-happen' the creation of Winter Quay. 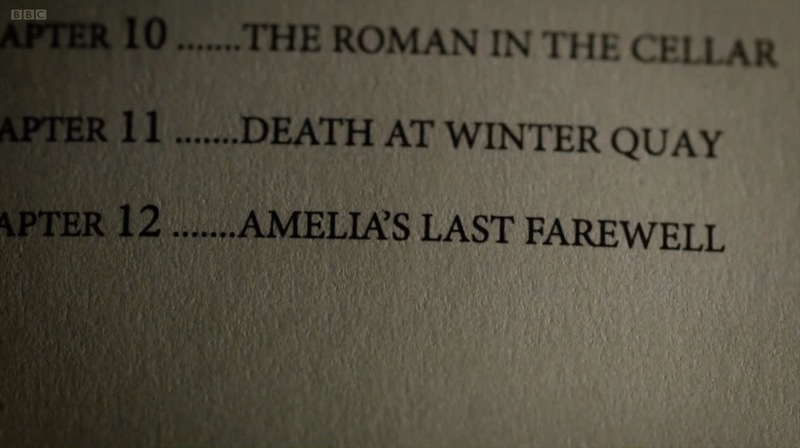 The chapter headings of River's book not only tell us where Rory has been but also enlighten the Doctor to Amy's possible fate. River's broken wrist is also symbolic of the fact that rewriting the future or vowing to resolve a problem through sentimental attachment is not always possible and that a physical injury or death can often ensue. As River notes, 'when one's in love with an ageless god who insists on the face of a 12 year-old, one does one's best to hide the damage' and reprimands the Doctor for healing her injury with his regeneration energy. It is a lesson he will clearly learn by the end of the episode when his own sentimental attachment to Amy and Rory is tested, their mortality is finally put into the context of his immortality. 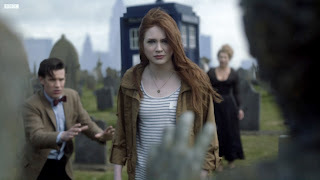 River herself warns Amy that 'he doesn't like endings', suggesting that her own impending death is as much a part of the Doctor's ability to outlast her. 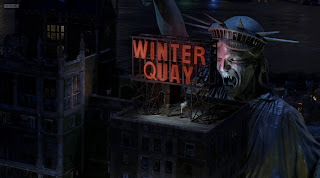 That theme also resonates in the disturbing scene where Rory meets his dying, older self in Winter Quay and where the moment of death is simultaneously being set in stone as a chapter in Melody Malone's novel: 'Death at Winter Quay'. Rory, as cursed as Kenny in South Park, dies again. In fact, he dies several times over in this single episode. The tragedy leads him into the last desperate escape from the building and the rooftop suicide. This is probably the strongest scene in the episode, dramatically, with Rory's faith in the paradox and his self-sacrifice to prove it shaking off Amy's last remaining attachments to the Doctor. This is the man she finally has faith in, it seems, even though it takes her some time to summon up that unswerving belief in him. Moffat uses this to reflect the River/Doctor relationship too, the notion of changing the future and rewriting time as faith in each other, as their 'marriage'. What bothers me slightly is that the Doctor has so little faith in his companions judging by his reaction to the creation of the paradox. 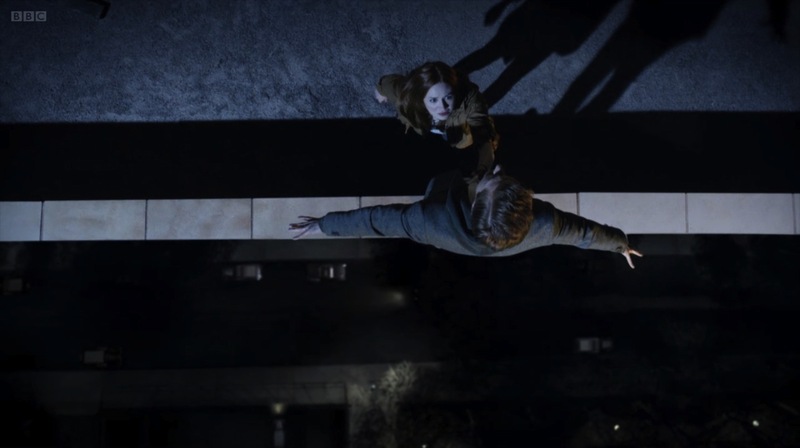 It goes without saying, Karen Gillan and Arthur Darvill are great but then the sequence ends with their jump off the roof and we're in different territory. This sequence will only work if you've made a decent emotional connection with Amy and Rory and you haven't spotted that hanging thread that Moffat's left in plain sight in that Manhattan cemetery. I have to admit that I have spent the last two and half years struggling with my empathy for these characters. Sadly, the episode spirals into an excess of melodrama when they jump off the roof. This was inevitable given that at the end of Doomsday Billie Piper cried through her mascara and into the hearts of the nation and it seems something similar - a tugging at the heartstrings - was deemed to be de rigeur here. 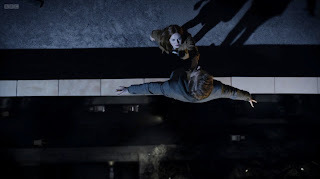 It's as overblown an ending as that of Doomsday, which didn't quite know where to end appropriately either, and the slow motion and syrupy musical scoring as they fall from the roof descends into manipulative nonsense, especially in light of the rug that Moffat then pulls from under the viewer's feet at the end of the episode. There, the paradox of their death is created and Winter Quay destroyed, yet an Angel somehow survives and kills Rory. The Doctor, who can reboot the universe and set time back on its path at the drop of a hat, the god with a 12 year-old's face, then claims he can't go back into time to rescue Rory. New York would apparently be crushed in the new paradox created. No emotional send off for Rory then, who for me is the better of the two characters out of the Ponds, despite not getting the lion's share of the scripts, but we get yet another teary salute from Amy. It's a bit of an overworked, sentimental ending which I suppose is appropriate considering that a major theme in the episode is about the Doctor avoiding such chronic sentimentality. Perhaps it would have worked if, after the jump from the roof, it had faded directly to the scene in the cemetery and the Titanic-style histrionics had been avoided. I quite like the fact that Amy ignores the Doctor's pleas to get back in the TARDIS and actually wants to be with Rory rather than him and that River, both as another mortal and as her daughter, understands this as the Doctor angrily orders them to 'stop it, just stop it'. 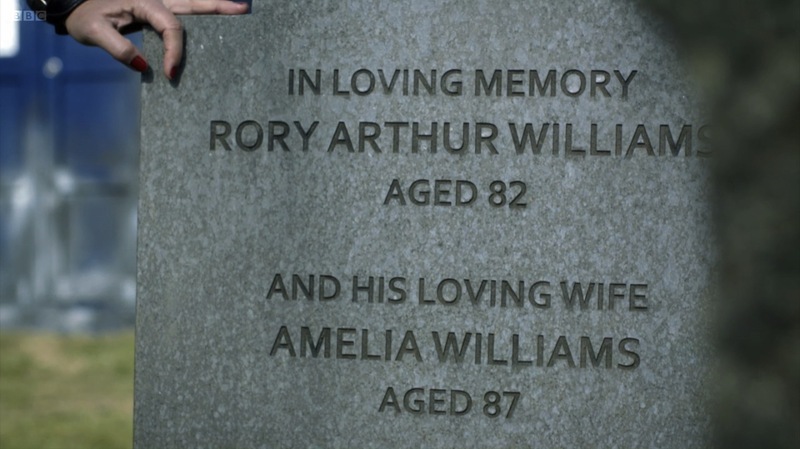 So Amy and Rory live happily ever after in the past, not quite properly dead. Moffat just can't bring himself to kill characters, can he? Everyone seems to get an afterlife; River, Amy, Rory and even that ultimate example of a character cheating death, Oswin, who's about to enter stage left, in some guise or other, in the Christmas special. The Time Lord is shown as powerless to do anything, especially in the presence of something as complicated as love, of a sentimentality that 'creates fixed time', apparently. 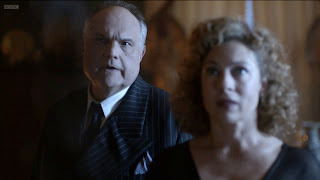 Another instance of Moffat quickly chucking a spanner in the works there to suggest a finality to Amy's action and yet, later, we hear River acknowledge that the book she will write, as Melody Malone, will get sent back to Amy to add her afterword. How does that 'fixed time' work? You can't go back and rescue companions yet you can send them books and go and visit their younger selves to effectively write their adventures as your companion well in advance. So in the end The Angels Take Manhattan is a recycled brew of major ingredients from the Moffat signature, successful for the most part but perhaps, by offering yet another permutation of the Weeping Angels and their abilities, he simply diminishes his creations to a marauding monster of the week. 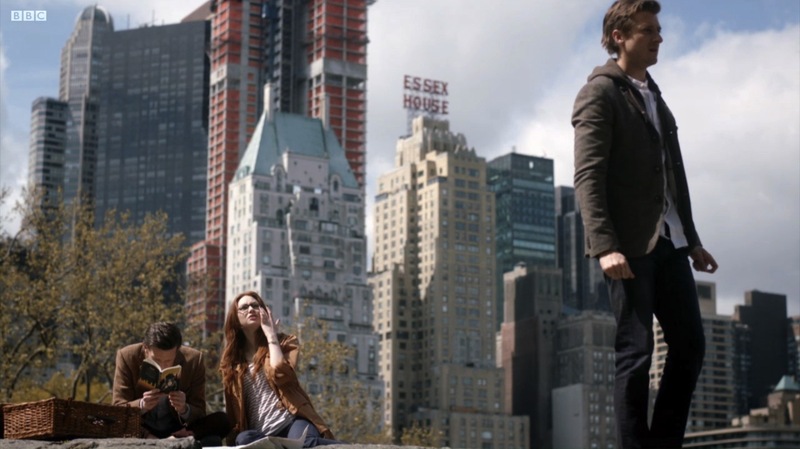 It looses cohesion in some instances and if you haven't invested in the Amy and Rory dynamic, which is one of my difficulties with this era, then the ending of the Ponds' story is either a tearful tragedy or perhaps something of a welcome change.